Selling your home is always challenging, but even more so if it’s a home you’ve lived in – perhaps raised a family in – for many years. If you’re a senior with a house full of memories (and accumulated belongings), the whole process can be overwhelming. Here are some home-selling tips to make it easier. For most homeowners, there comes a time when the kids are gone and it’s time to start thinking about downsizing. Whether you plan to move into a retirement community, or perhaps a condo in Florida, getting your current home in ready-to-sell condition can be an exhausting thought. Even if you’re not technically a hoarder, you probably have accumulated a lot of stuff over the years, and while you may love all your things, you know that clutter does not help sell a house. You want to get a good price for a home that is probably one of your biggest assets, so that means there is work to be done! Take The Sold.com Home Seller Quiz — This free and easy tool will reveal your optimal home selling option. Get Financial Advice – Talk to your accountant or financial planner. Selling your house will have tax and other financial ramifications, and you don’t want any of them to be a surprise. If you’re selling at a loss, you may be able to take a tax write-off. If you’re selling it again, you will likely be able to exclude much if not all of the gain and avoid paying taxes on it. Consult a professional ahead of time so you know what to expect. Declutter – Most seniors who move are planning to downsize, so you’ll need to start weeding things out before you move anyway. Do it before you put your house on the market to ensure that your home looks its best. If you’ve got a lot of old report cards and macaroni artwork from your children’s younger days, perhaps invite them over to help sort through everything. If they say “toss it,” then you shouldn’t feel guilty to let it go. And if they think something is too precious to throw out, you can invite them to take it home with them! Younger folks will also be helpful in reaching into high closets, crawling up into attics or down into basements. Why strain your back – what are kids for, anyway? Fix it Up – If you’ve lived in your home for a while, chances are it may need a few fixes and updates before it’s ready to put on the market. Some folks love a good DIY project – and others call their kids to come over and change a burnt-out light bulb. Be realistic about what you can, or should, do yourself. If you have friends or family who are handy, maybe they’d be happy to come over one afternoon and repaint the front door or clean out the gutters. But if not, you’ll want to find a reliable contractor (if you have big projects) or handyman (if there are only minor, small repairs to be done). Get advice from a realtor on what repairs you should do to maximize the value of your home. 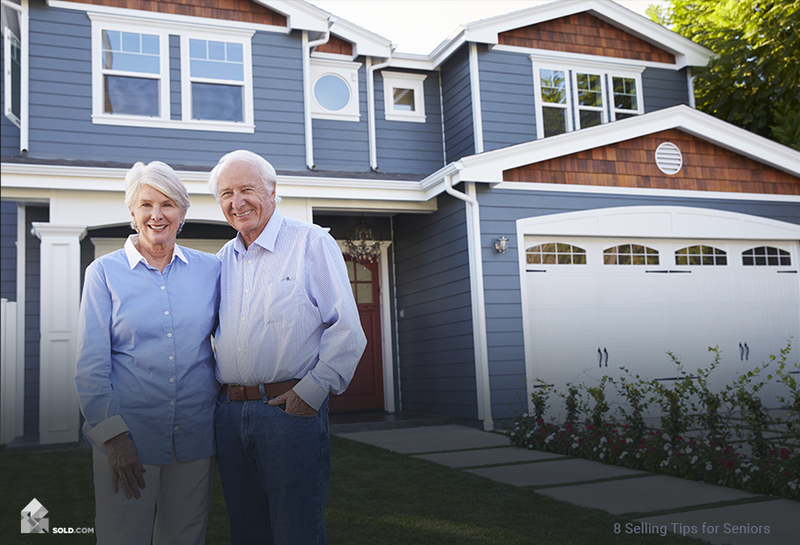 Find the Right Real Estate Agent — The National Association of Realtors (NAR) says that there are about 20,000 agents nationwide who specialize in working with older sellers and their homes. While you may not need a specialist, you do need someone who is sensitive to your particular needs and situation. Ask friends and family for referrals, and meet with several agents before you make a decision. Consider Hiring a Professional Stager – Hiring professionals to create a specific look for your home is a relatively new innovation, and it may seem unnecessary. But the Real Estate Staging Association (RESA) reports that “unstaged” homes sat on the market an average of 143 days. Homes that were staged before listing averaged only 23 days on the market! What’s more, a survey from the National Association of Realtors (NAR) found that 52% of buyer’s realtors think that buyers offer more for staged homes. While most (32%) thought the increase was modest (1%-5%), some believed staging boosted a home’s value by as much as 20%! Even if you decide you don’t want to hire a home-staging professional, you should definitely look into doing at least some kind of staging. Keep in mind, many of the homes your home will be competing with are going to be doing it. If you’re on the fence, check out this article on the Pros and Cons of Staging your Home Yourself. Stay Organized – Come up with a plan. If you think about all the things you need to do to prepare your house for sale, you likely will become overwhelmed and either do nothing or only get things partly-finished. Break down all the tasks you need to do into manageable steps. For example, with decluttering: tackle one room – or even one part of a room – at a time. Make a schedule. If you plan it all out, you’ll be amazed at how much you can get done. Get Out of the House for Showings – While it may be inconvenient to leave, you definitely should. Buyers may feel inhibited if you’re sitting there in the living room while they walk through, trying to imagine themselves living in the space. To minimize inconvenience, have your real estate agent group showings together and perhaps limit them to once a week. Lastly, Be Patient with Yourself and Don’t Stress! – Unless there is some urgent reason to sell NOW, come up with a realistic plan for getting your house ready and take the time needed to do it right. None of us are as young as we used to be, and it’s likely there are a lot of things that need to get done. Slow and steady gets the job done. Worrying or fretting about what still needs doing doesn’t actually help get those things done! So cut yourself some slack and focus on making slow but steady progress towards your home-selling goal.